Chatbots are the “wow” weapon to communicate with customers. It’s here to revolutionize the way our businesses communicate with the customers. Slowly and steadily, AI technology is taking over the digital space and chatbot is one of the needle movers. In the world of B2B and B2C marketing, chatbot app development has lately overshadowed email marketing due to its ability to start a conversation and offer advance components. By now the majority of us have already interacted with a chatbot on Facebook messenger or on web pages. As more businesses have been deploying online marketing, using chatbots has become ubiquitous nowadays. Chatbot is a software program which uses messaging as its foremost interface, facilitating different business and administration works. Don’t think chatbot as a mere replacement for your help desk. They are predominately altering the way businesses deliver the customer experience. Today, we are talking about how chatbot development is geared up to help the core customer support for both B2B and B2C. A simple chatbot scans the keywords in a customer’s inquiry to deliver pre-programmed answers. 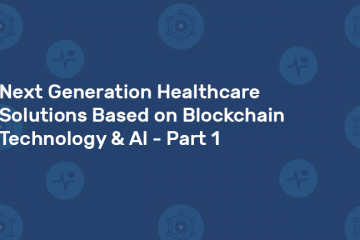 On the other hand, an advanced chatbot which is powered by AI and machine learning uses natural language processing (NLP) to revert more complex conversations. When a chatbot is integrated seamlessly with a company’s website or smartphone app, it can do a lot of things to optimize the customer service. You can have chatbots that connect with calendars, fix dates, route leads and interact. By using machine learning and NLP in a chatbot, you can review sales emails replies and automatically unsubscribe people. For example, platforms like Drift is intelligent enough to opt people out who don’t want any more emails or notifications. 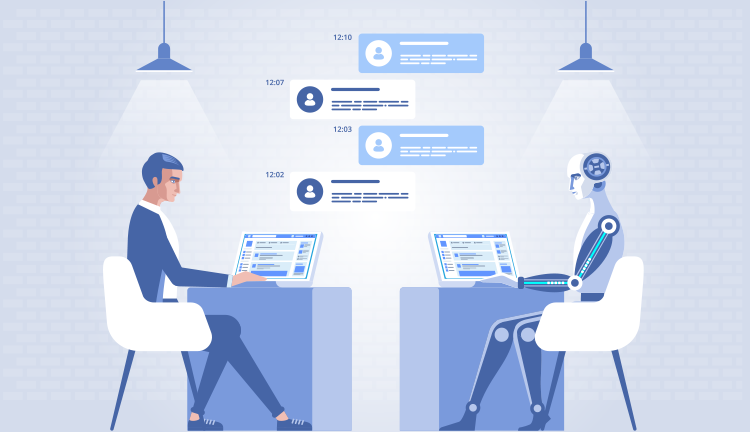 Your sales and marketing teams could engage themselves in more productive work when these AI-powered chatbots simultaneously can support customer interactions. Chatbot Survey by Mindbrowser, 2017, revealed which industries will benefit the most from their use: E-commerce 90%, insurance about 75%, healthcare about 73%, customer service about 95%, sales, and marketing 55% and order processing 48%. You need a conversational marketing and sales platform to help your potential customers buying from you. Your chatbot can streamline your sales, offer better customer experiences and make selling & buying easy. You can reproduce your marketing goals over the chat environment. For example, for surveying a business, rather than sending emails to clients, using chatbots would be a smart choice. While emails have only 10% open rate, chats have 80% higher response rate. Did you know emails have an only 10% open rate? In this scenario, chat provides a better chance to connect with your potential clients or customers. Building audience is essentially similar to conversion for marketers where chatbots can help. So, if you want people to see, read and sign up for things, you can do them via chat instead of emails. As connecting and conversing are becoming much more natural, you will experience substantial growth in conversion rates. If you think from the audience perspective, chats are on the go phenomenon which makes it easy to gain the information rather than searching over websites or mailbox. You have to be a little tricky while pre-programing the conversation to gain more attraction from the customers. It is better to break the elongated content into pieces and deliver it over chat. This way you can convey your message well to grab their attention. Remember, these advanced chatbots are powered by AI and ML, so you get a maximum space to experiment for a colossal impression. As a business using online chat in combination with chatbot can minimize response times, resolving issues much faster. When your human team is online, they can take the lead in responding to incoming chats. But when they are offline, chatbots can step in to support so that your brand’s response time doesn’t suffer. 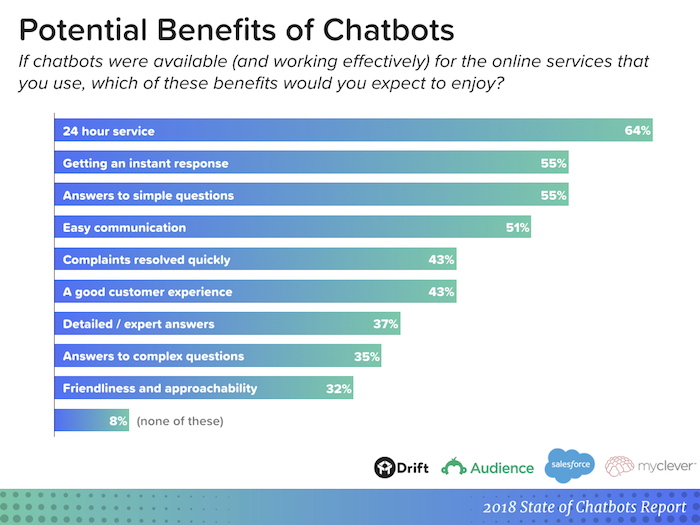 The State of Chatbot Reports by Drift, 2018 interviewed consumers for the Drift-Report named the following benefits: 24-hour service (64%), direct responses (55%), answers to simple questions (55%). Since we are talking about chatbots using NLP methods, the software can analyze customers’ query and deliver a response that meets the needs. Well, B2C marketers get more space to improve the marketing and sales experience. Customer support chat web apps are already very famous among businesses. 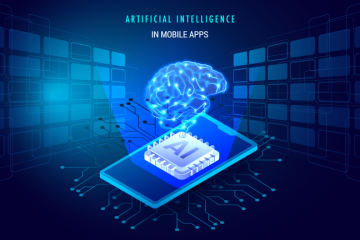 To survive in the long-term, you must deploy chatbots on different platforms such as Twitter, Facebook or SMS to encourage multi-channel engagement. This will turn the impact of the brand perception and outreach. Conventional emails are of course replaced by real-time notifications which help you to get in touch with both distributors and customers. You can also optimize your customer support workflows by automating responses to repeat inquiries, such as cancellation or balance requests. To ensure that your customers are getting the service they desire, approaches like direct video chats, real-time messaging, voice assistants can add more value to your strategy. Chatbots are great advantages when you have a service or product to offer and help your customers staying online 24/7. ML is getting closer to a point where it is harder to tell whether you are talking to a human or a computer. Developing an attractive and helpful chatbot is still a little challenging from UX outlook. For that, you need an experienced chatbot app development team to guide you. However, you shouldn’t expect chatbots to completely automate your customer support. It doesn’t encompass the creativity or critical thinking that your human team can do for the job. AI-powered chatbot can deal with communicating at the right time on the right channel, so you can scheme your strategy accordingly. Undeniably, chatbot app minimizes resolution time ensuring reduced costs and enhanced customer experience. It offers the real-time and on-demand experience that the users have been craving for long. 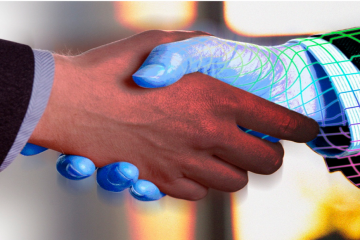 As the acceptance of AI and machine learning increases, customer service will render to be flawless in every way.